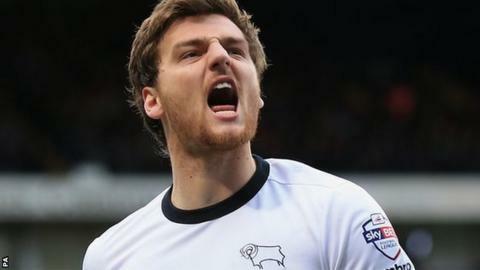 Derby County extended their unbeaten league run to five games as they comfortably beat struggling Brentford. The Rams started well and took the lead when Chris Martin poked home Cyrus Christie's precise cross. Tom Ince's neat finish doubled the lead shortly before half-time following good play from Jeff Hendrick. Brentford's best chance fell to Philipp Hofmann, whose shot was cleared off the line by Christie as Derby claimed their fourth win in five games. They move up to seventh in the Championship, while Brentford, who have lost both matches since Lee Carsley took over and four of their past five, drop to 20th. Derby midfielder Johnny Russell made his 100th appearance for the Rams since joining from Scottish Premiership side Dundee United in June 2013. After a scrappy first 20 minutes, Derby took the lead when Christie's brilliant first-time cross found the in-form Martin, who tapped in for his fifth league goal of the season. The Rams went close to doubling their lead through Ince's curling effort, before Bradley Johnson's shot was brilliantly saved by Brentford goalkeeper David Button. Ince finished off an excellent team move following good link-up play by George Thorne and Hendrick. After the break, Johnson's header from Ince's corner was superbly saved by Button. Brentford, who offered little throughout, almost reduced the deficit late on when Christie got back well to clear Hofmann's shot off the line. "We all felt that pressure of needing to win at home and it's pleasing that it has come on the back of some really good results away from home. "It was maybe the best we've played this season in the first half because I thought it showed all the qualities we have, that we can defend, pressurise, get the tactics right, create and take opportunities. "It was not so good at the end, a team in slightly better form could have hurt us, but we'll take the positives out of it. "I'm much more encouraged, we've shown we can beat some good teams, win while not playing well and win while playing well. We're not there though, we've got to keep improving. [Darren Bent's omission) "It was unfortunate, it can happen, he arrived late and I needed to name the team. Anyone can get stuck in traffic but I couldn't be totally sure what time he would arrive." "We did okay in the first half but didn't really carry much threat. There's a lack of confidence and that's the hardest thing in football. "We have players here who are new to the English game and we need to give them a bit of time. "I would rather lose 2-0 trying to get something out of the game, so if Alan Judge's shot goes in off the bar then it's a different story. "I was disappointed that we went a little ragged after they scored but we have some good players here and they will go on to have a great season." Match ends, Derby County 2, Brentford 0. Second Half ends, Derby County 2, Brentford 0. John Swift (Brentford) wins a free kick on the right wing. Attempt blocked. Alan Judge (Brentford) left footed shot from outside the box is blocked. Assisted by John Swift with a headed pass. Attempt missed. Jamie Hanson (Derby County) right footed shot from outside the box is high and wide to the left. Attempt blocked. Andreas Weimann (Derby County) left footed shot from the centre of the box is blocked. Assisted by Jeff Hendrick. Attempt missed. Andreas Weimann (Derby County) right footed shot from the right side of the six yard box is close, but misses to the right. Assisted by Tom Ince with a cross. Attempt blocked. Philipp Hofmann (Brentford) left footed shot from the right side of the box is blocked. Tom Ince (Derby County) is shown the yellow card. Ryan Woods (Brentford) wins a free kick on the right wing. Corner, Brentford. Conceded by Ryan Shotton. Philipp Hofmann (Brentford) wins a free kick on the right wing. Attempt blocked. Tom Ince (Derby County) left footed shot from outside the box is blocked. Assisted by Andreas Weimann. Attempt saved. Marco Djuricin (Brentford) right footed shot from outside the box is saved in the centre of the goal. Assisted by Ryan Woods. Attempt missed. Johnny Russell (Derby County) right footed shot from the right side of the box is too high. Assisted by Andreas Weimann. Substitution, Derby County. Andreas Weimann replaces Bradley Johnson because of an injury. Corner, Brentford. Conceded by Cyrus Christie. Delay in match Bradley Johnson (Derby County) because of an injury. Attempt missed. Jeff Hendrick (Derby County) right footed shot from outside the box is too high following a corner. Attempt blocked. Philipp Hofmann (Brentford) left footed shot from the right side of the box is blocked. Assisted by John Swift. Substitution, Brentford. John Swift replaces Toumani Diagouraga. Attempt missed. Jeff Hendrick (Derby County) right footed shot from outside the box is close, but misses to the right. Assisted by Chris Martin with a headed pass. Attempt saved. Philipp Hofmann (Brentford) left footed shot from the centre of the box is saved in the bottom right corner. Assisted by Nico Yennaris with a cross. Nico Yennaris (Brentford) is shown the yellow card for a bad foul. Corner, Derby County. Conceded by James Tarkowski. Attempt blocked. George Thorne (Derby County) right footed shot from outside the box is blocked. Assisted by Richard Keogh.